The Best Tooth Whitening Toothpaste? - Oh So Girly! I try to be health conscious and choose toothpastes that are free of chemicals like parabens, sodium lauryl sulphate and other things which are often advised we stay clear of. After consulting with my friends who work in the Naturopathy and Nutrition field, I settled on a toothpaste called AloeDent: Whitening , which seemed a promising mix of being from the healthy end of the toothpastes and – well, it had “whitening” promised in its very name! One month on, I can honestly say I’ve noticed a *huge* difference in how white my teeth are. They’re not fluorescent white or anything (thankfully! ^_^); more natural tooth-white. Perhaps it’s a move up from something like champagne to something more like pale ivory, and when I look in the mirror it definitely looks noticeably much whiter than before. I’ve even received several compliments about how lovely and pearly white my smile is and on my minty fresh breath. So whilst I haven’t tried enough kinds of whitening toothpastes to tell you if this is the very best tooth whitening toothpaste out there, I *can* tell you that I’ve tried this one and have seen great results with it. You can read the reviews for Aloedent tooth whitening toothpaste from Amazon.co.uk, here , here and here . 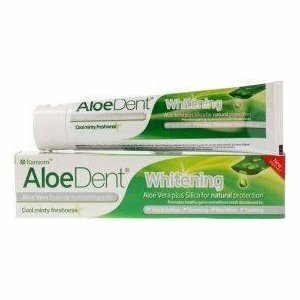 Where can I buy this Aloedent tooth whitening toothpaste? You can get it on Amazon.com. There are two pages on Amazon.com from which you can purchase Aloedent whitening toothpaste, here and here . If you’re in the UK like me, Aloedent is available in many health shops as well as on Amazon.co.uk.